I am at Stellar Elite School today; my two year course in early childhood development is paying off. This is a primary school and I am teaching standard three students. My son John finished his treatment last year in August. When the day came, I took him to Green House, a clinic run by Médecins Sans Frontières, and surprisingly the staff had planned a small farewell party for him. I have never seen him so happy especially when the staff gave him a bicycle. He was so proud and excited. Before he got used to his treatment completion, he kept asking when we were going back. I explained to him, and as a mother, I was filled with joy that my son no longer had to deal with the strenuous treatment and injections. He has now grown bigger, stronger and he also joined this same school I am teaching. I am also very glad that my husband and daughter are all in good health. I heave a sigh of relief every time their tests come back negative. "As a mother, I was filled with joy that my son no longer had to deal with the strenuous treatment and injections"
I decided to come back to teaching because I feel much better and I enjoy teaching. It is also important for me to be back because I see this as a huge step towards my full recovery. I like being with children to teach them new things, play with them; this is my joy. See, when I am teaching and active, it means I am not very sick. But there are changes that have occurred in my physical looks and often some children will come to me and wonder, “teacher you were much light skinned, why has your skin become darker?” And because we had such a good relationship by the time I left, some ask, “why haven’t you been coming to see us?” Such questions simultaneously make me sad and excited. Elizabeth and her students. 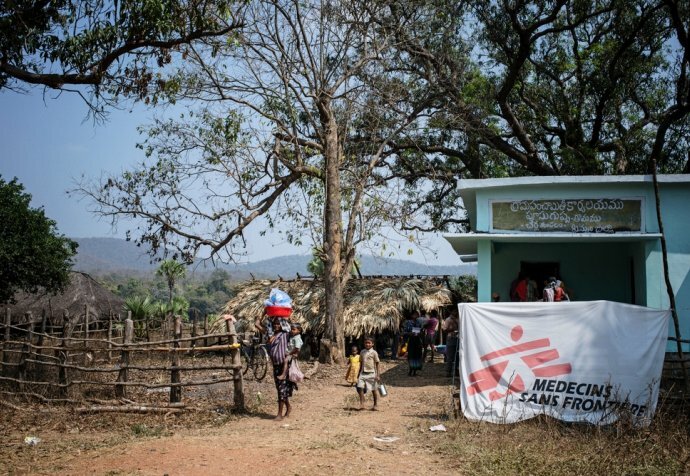 © MSF. Some of the children are very young to entirely comprehend complex TB, let alone XDR-TB issues. However, health matters and different types of diseases are part of the school syllabus so while teaching, I take the time to slowly explain TB, and as I conclude, I share my story of having the disease but getting treated in the hope that they´ll know it is a treatable disease I have faced a couple of challenges since I came back, I can never come to class in time like other teachers. Because I am still on treatment, the first station I report to is the Green House then work. I arrive to work two or three hours later to find the other teachers busy working. Sometime I feel tired and dizzy because of the medicine. But I am very grateful because my fellow teachers have been very supportive. They watch over my class, make sure they are doing their homework, taking their tea in my absence. I remember one time a parent complained citing my lateness but the head of the school explained my situation to the parent. This support makes my treatment schedule more manageable. Elizabeth teaching her class © MSF. I am longing to finish my medication by May this year and my expectation and hope is that I will never get MDR or XDR TB again. I will celebrate by going to church and thanking God. And as I move on with 2016, I plan to invest, work hard and save money as my daughter is nearly going to high school and I will need all the money I can get to support her through it. The school here is paying me, though not a substantial amount, I am very lucky to have a job.